Turn growth into bloom, quick! Adapted from best practice commercial horticulture, Early turn A&B has now been perfected for use in domestic hydroponics. Early turn A&B, in its horticultural form, has been used worldwide to boost commercial food production since the eighties and is still being used today. 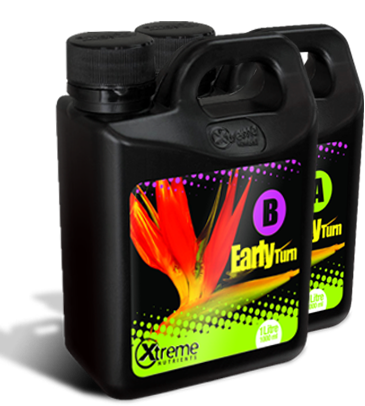 Early turn A&B is a highly potent bloom simulator that also increases the effectiveness of other fertilizers and additives. With our innovative research, we have been able to develop this product into a precise and reliable tool to enhance your crop every time. Early turn A&B is used in the first and second week of flowering and has two primary actions. The first action is the transition. As you already know, the day light hours shorten gradually in nature, but in hydroponics, the daylight hours are shortened instantly. This sudden change causes some stress to the plants. We recognized this stress, and developed Early turn A&B to specifically account for this problem by encouraging the plants adapt seamlessly to the new environment. You will see this transition has been better for the plants as they will produce flowering sites much earlier than before. The second action is to stimulate. After the plant has been caringly introduced to the new environment, Early Turn will encourage rapid bloom of the flowers. As the flowers already have a head start from the initial stage, Early turn A&B easily stimulates the plant into full flowering production much earlier than normal. Also this same stimulate increases fertilizer usage and metabolic rate. The obvious benefit you will enjoy is either shortened growing cycles or same length growing cycles with far greater yields. The beauty is, you decide which way to turn. Early turn A&B, take some home and see the results for yourself! User part A in first week of flowering at a rate of 10 ml per gallons of working solution. This will stop vegetative growth and initiate flowers production within 3 to 5 days. Use part B in second week of flowering at a rate of 10 ml per gallons of working solution.